o computer is free from junk data. Operating system helps to keep the record of all the actions completed on computer by maintaining evidence of each task. Macintosh users may fail to notice that memory space is been occupied by unwanted junk for years. This results in slow startup, slow response, low disk space and other complications on Mac. Mac performance can be improved, if junk data is removed. Yodot Mac Cleaner is a suitable solution to clear all such unseen, unwanted data on Mac. This tool securely eliminates all junk files from Mac computer with simple mouse clicks and increases its overall performance. Its features not only ends till junk file cleanup, but it can also erase trash files, App junk, duplicate images, plug-ins, login items and other extensions of apps easily. This helps to prevent memory clogging by freeing up unused memory space. It also plays secure driver wiper role, which helps to remove entire data on Mac drive (This will help to avoid sharing your personal data to unknown buyers). One of its unique features is that, it provides ‘Schedule’ option, using which one can automate the cleaning process. This has the simple interface which helps even a novice user to clean and optimize his Mac. It’s advanced algorithm can locate the data easily and wipes them. 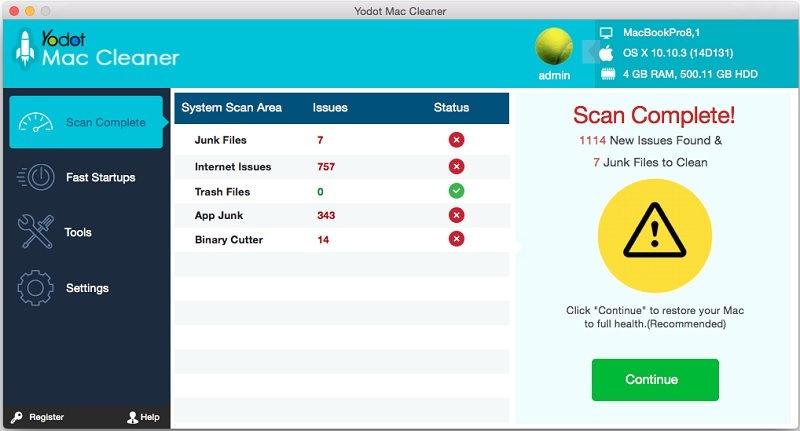 Yodot Mac Cleaner can be used when your system takes longer time to respond to user commands, when it shows low disk space or insufficient memory space errors, Mac consuming too much time to boot and in many such circumstances. This program can be installed on Mac OS X Lion (10.7), Mac OS X Mountain Lion (10.8), Mac OS X Mavericks (10.9), Mac OS X Yosemite (10.10) operating system. It supports all 64-bit Mac OS X systems. Yodot team will be 24/7 available for free support i.e. provides assistance for all kind of queries related to product round the clock.